If you are like me, you are interested in all things home. You love to cook, and often find yourself tinkering around in your garden, or doing projects to add to your home decor. And you are good at them all. Perhaps friends have told you that it might be an idea to start a home and garden blog. If that is the case, what are you waiting for? Do you think it would be too difficult and that you are not tech savvy? Starting a Home and Garden Blog is easier than you might think. You may think that starting a home and garden blog is something that you will need to hire an expert for. This is simply not the case. So, grab a cup of coffee and let’s get started. In no time at all, these blogging resources will have your home and garden blog started and you’ll be able to share all your great tipsand recipes just like I did. Get a host to store your files online. 1. Get a domain name. The first step in starting a home and garden blog could not be easier, and it’s actually quite fun. When I first decided I wanted to write a blog, my husband and I brainstormed for a while to come up with different names. Think through what it is that you would like to write about on your blog and see if you can come up with a name that suits the topics. Since, I love to garden and cook, it was a no brainer for me….I chose The Gardening Cook as my domain name. Not all names are available, so you may have to try a few to get one that is not taken. I advise that your domain has a dot com ending. It is what most people expect. But this also means that the name you want could already be taken. Head on over to GoDaddy and type the name you would like into the search box that looks like this image. You will know in seconds if it is available. 2. Get a Web Host. Your web host is sort of like your landlord for your blog. It is a means of renting space online for all your files and images. I use A2 Hosting and highly recommend them. I have tried several companies to hosting during the time I have had my blog up and running. This company has outstanding up time (almost 100%!) and offers wonderful service if you need help. When you get there, you will land on this page. Just click the link that says shared hosting. Now it’s time to choose the plan. As your blog grows, you will incur larger hosting costs, but for now, a basic plan is fine. It will let you do one website and has unlimited file storage and file transfer at a great price. 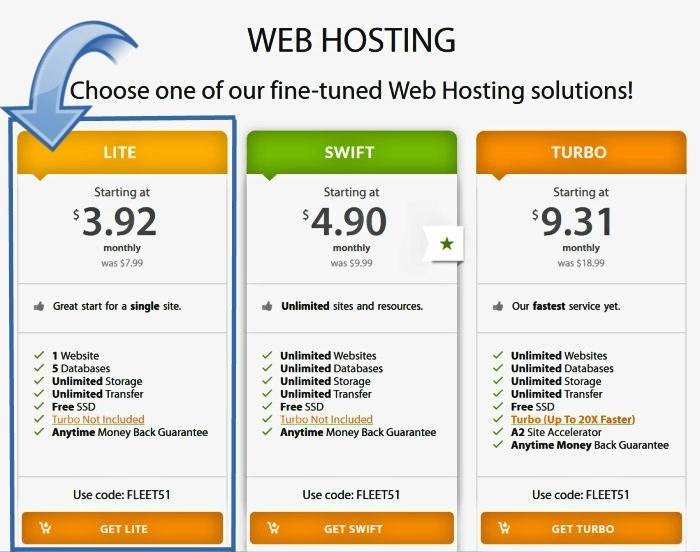 Once you purchase the hosting package, you will be given what is called nameservers in an email from the company. Head back to Go Daddy, and log into your account. 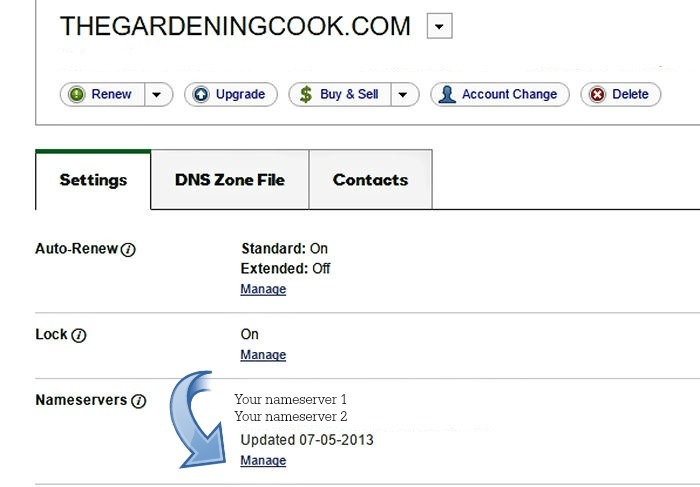 Click on your domain and then on the word manage under the area called name servers. Add your new nameservers in this area. This tells GoDaddy that your domain is stored on the A2 Hosting site. 3. Time To Install WordPress. (Note: each host has a slightly different way to install WordPress. Sometimes they will even do it for you at not cost. It is worth asking! My instructions show the way I installed my version, but most are quite similar to the screen shots shown below.) When you have finished signing up for your web hosting plan, it is time to install WordPress. 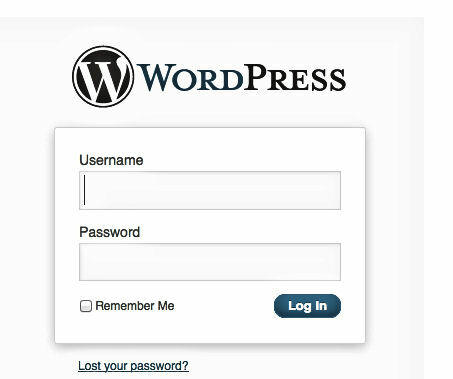 WordPress is a software program for blogging and the one that I use for thegardeningcook.com It is easy to use and very easy to install on your website by just following a few simple steps. Log into the C Panel at the A2 Hosting account that you have just set up. (They will send the link to this in an email after you sign up.) Scroll down until you come to the Software Section. 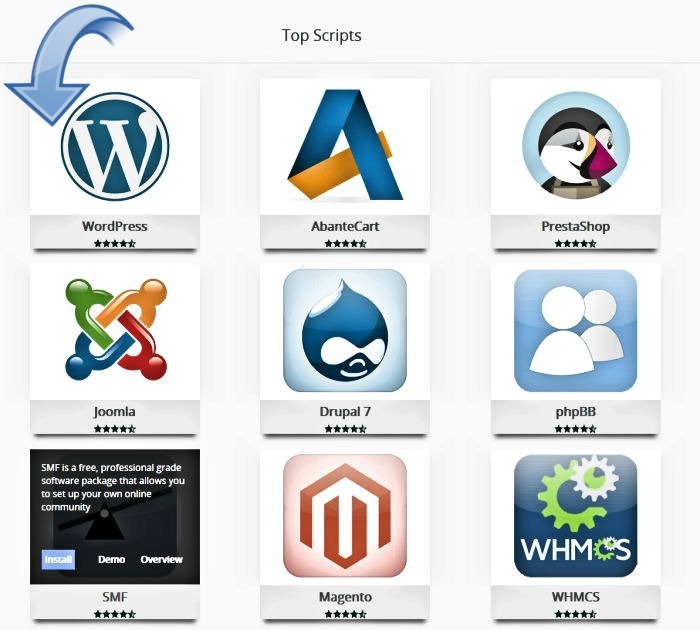 Click on the words Softaculous Apps Installer. Next, click on the WordPress Icon. On the next page, click on the install button. 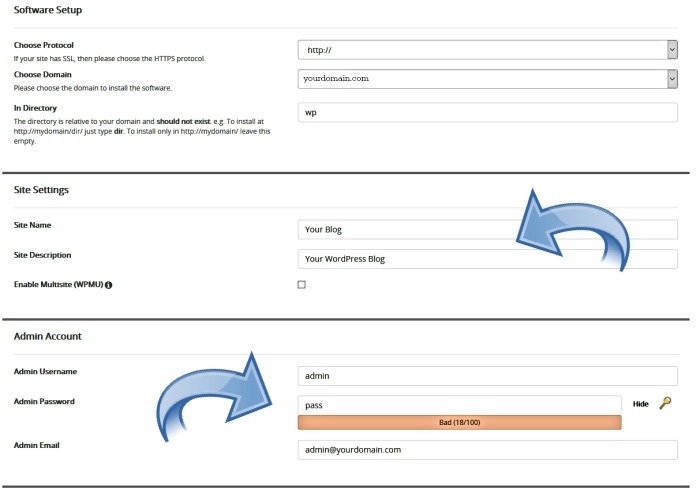 Scroll down and fill in the settings with the name of your blog and a site description. Then choose a password. Make it a good, strong one (they will tell you if it is strong) and copy the user name and password down. You will probably not have to make changes in the next area unless you have a site in another language. You can browse for a theme now if you wish, but I find it easier to do this later. 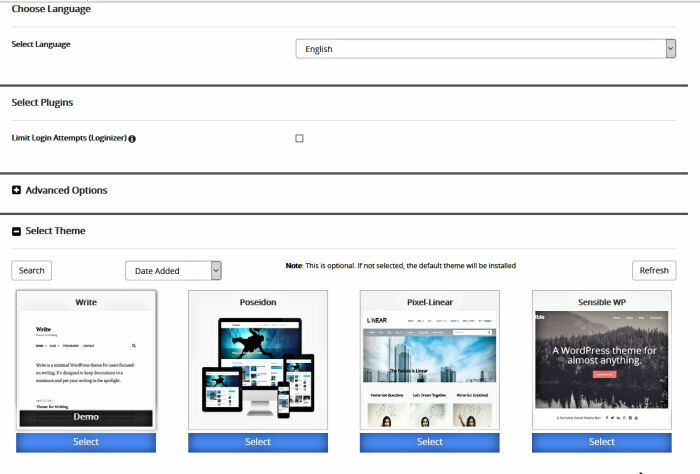 If you don’t choose a theme WordPress will select the default theme. 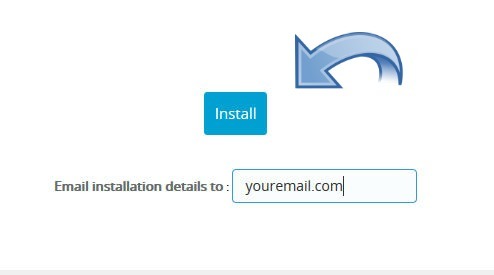 The last step is to add your email address and click install! That’s it. 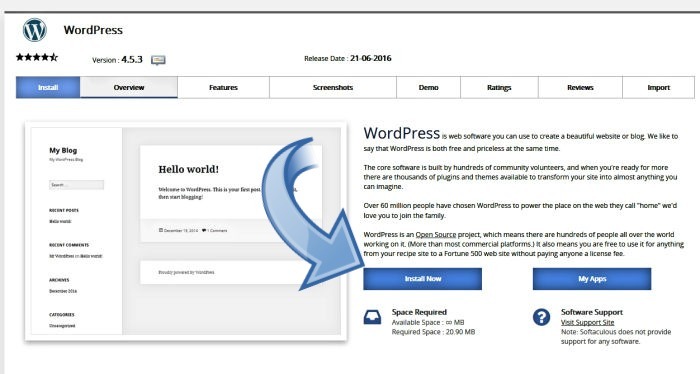 WordPress will be installed on your hosting site and is ready for you to start making it yours. You will be given an admin URL for your site. Type this URL into your web browser. You will see a login screen like the one below. This is where you enter the Username and Password the you copied down from the previous step. This is the time to think about what you would like your categories to be. Everything can be changed later, but it’s a good idea to do some forward thinking and planning now. 5. Add your Plug Ins. There are hundreds of plug ins that can make life easier for you on your home and garden blog. These are some that I recommend to get you started. That is all you need to get up and running with a WordPress home and garden blog. All that is left to do is to to start adding your content and sharing on Social Media. Have fun! Thanks for sharing way that how we can start landscape. Though this blog is not about manual gardening but we can take some ideas from this blog. We too provide gardening landscaping service in your area, So if you are a lover of natural beauty then you can get our service. This is an incredible article for anyone having even a small intention to start a blog. Thank you for this detailed post, it makes me think how passionate a person has to be about the chosen niche so as to persist and diversify through the various phases of blogging.